While everyone is freaking out about Amazon's plan to unleash an army of delivery drones on the world, it's important to remember that these flying robots can do much more than just move packages. 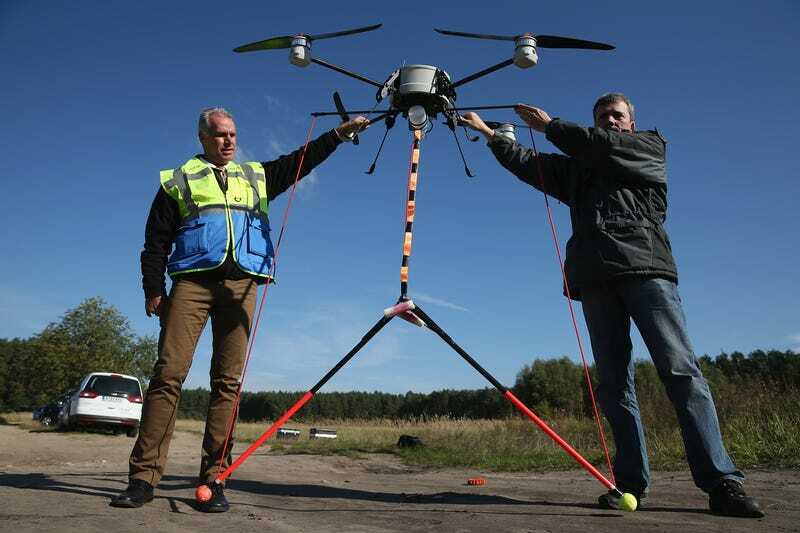 As the technology has improved and dramatically dropped in price, people have been coming up with all kinds of crazy and creative uses for unmanned aerial vehicles (UAVs). And, honestly, the sky's the limit (heh) as far as what drones can do. Analysts expect drones to grow into a $10 billion industry in the next three years alone, which means that UAVs will keep getting better. For now, we've made a nice little list of what drones can do. It's a long list, but surely not exhaustive—so let us know in the comments if we missed anything! Farmers have a tough job, but drones can make it easier: they're a great way to do aerial surveys of crops. This way, farmers can see if their irrigation systems are working, how their plants are growing, even see if any of the plants are sick by using infrared technology. Farms are often pretty damn big so the mobility and agility of the drone comes in handy. Sure beats walking. Here's an unexpected use of drones. A team of researchers at ETH Zurich recently programmed drones to build and weave tensile structures. While the test was relatively simple, the idea of choreographing drones to act as aerial construction workers is pretty fascinating. Trying to sell your house? Well, wouldn't it be cool if you could offer potential buyers an aerial view of the property, all dramatic and nice? The real estate industry's all over this idea, and it's becoming increasingly common for property listings to be accompanied by a drone tour. There have been some legal snags—like in Los Angeles, where the LAPD shut down real estate drones—but new legislation is reversing the ban. This is obviously happening. It wasn't long after camera-laden drones hit the market for paparazzi to realize that they're the perfect tool for spying on celebrities. Earlier this year, paparazzi used a drone to clear the walls of a Swiss estate to snap photos of Tina Turner's wedding with Erwin Bach. The police ended up catching the photographer who had been piloting the UAV, but this surely won't be the last incident of a paparazzo getting industrious with drones. Drones are great for sports and, well, pretty much any big event with interesting activities going on that look even more interesting when viewed from above. Not only is it entertaining to watch games from above, it also gives coaches a unique and valuable perspective on how their players are doing. Drones have even made an appearance at the Olympics. Here's where things start to get a little hairy. Police departments across the country are buying drones that they can use for surveillance and related activity. Even the FBI is using them. This obviously stirs up some serious Fourth Amendment concerns and is a hot topic amongst civil liberties advocates like the ACLU. But, for now, cops can do pretty much anything they want with them. Like police, border patrol agencies are making use of this new tool for law enforcement. In fact, drones have been popular with this set for a while. The entire U.S.-Mexico border has been patrolled by drones for the past three years. Now, border control actually wants to arm the drones. Immigration activists are going to love that idea. All kinds of scientists are using drones to keep track of the environment, from authorities potting environmental violations to the EPA testing air quality. NASA is even using drones to test the makeup of the ozone. Drones used for environmental monitoring is already the topic of many an academic paper, and the trend is only supposed to get more popular. In Italy, for examples, drones have been spying on illegal dumping for years. Speaking of the environment, drones are becoming an incredibly useful tool for firefighters, especially those who have the seemingly impossible task of putting out wildfires. There, the aircraft are used not only for spotting wildfires and gauging their movement; they can actually fight fires now, keeping people out of harm's way. Although there are some hurdles to clear with the FAA, firefighters are optimistic about the future. Oh, hey, a happy story. Drones aren't just being used to kill wildlife; they're also being used to monitor populations of animals in the wild, especially endangered ones. A team of Indonesian scientists, for instance, have been using drones to keep track of a population of endangered Sumatran orangutans by floating above the treetops and watching how the apes are dealing with deforestation. You imagine how many other endangered species could use some help, too. Domino's Pizza turned some heads earlier this year when they posted a video of a drone delivering a pizza. The idea was that drones could get the pizza to your house faster so it would be hotter and more delicious. But, seriously, can you imagine any pizza chain buying a fleet of drones to take over its delivery service? How about burritos? That brings us back to Amazon and its plan to deliver your purchases with drones. Amazon CEO Jeff Bezos says, "It will work and it will happen, and it's gonna be a lot of fun." But we have our doubts. Nevertheless, UPS followed suit this week and revealed that they, too, were working on a drone delivery system. We've got news for you, though. China's one step ahead of us on this. There's no tool more important for solid reporting than a camera to catch the action as it happens—except maybe a pencil and paper, but that's beside the point. Journalism students across the country are already learning how drones could help them be better reporters, and some reporters are already using the aircraft. Now, if only drones could tweet. Offshore oil rigs are notoriously tough to maintain, which is potentially dangerous because Deepwater Horizon. Drones can be a huge help, though, because they can fly into hard-to-reach places. The same goes for monitoring oil fields and pipelines, which can be vast and tough for a human to keep track of. Picture this: a nonprofit manages to stockpile medicine for people in remote African villages, but they can't get to the remote areas fast enough to save lives. Send in the drones! A company called Matternet is doing just that by building a network for drone-based deliveries to remote areas. It's like Amazon's plan, only altruistic. A graduate student from Austria recently took that medicine example to the next level. Stefen Riegebauer devised a system whereby drones could deliver defibrillators to heart attack victims much faster than it would take an ambulance to get there. It's kind of out there and concept-y, but the idea of drone-based EMTs is interesting. All that said, there's a very simple and pretty damn neat use for drones: flying them. Like the remote-controlled airplane enthusiasts of yesteryear, a new generation of hobbyists is finding simple bliss in getting quadcopters and other drones airborne and making pretty videos. We've tried it. It really is super fun.